By Augustus Johannes Roesen von Rosenhof, published from 1746-1761. Historiae Polyporum. Two other "snakes" Rösel has drawn and described. The animal in the upper half is about 10 mm long. Rösel describes it as "the made similar snakes" that feeds on water fleas. Scaribaeorum Terrestrial -Tafel IV. 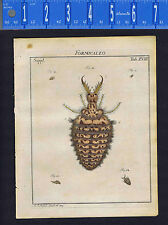 Roesel/Rosel 1749 Hand-Colored Natural History Print. It is based on Rösel’s collection of insects. "Roesel also made the engravings of his drawings and, until his death in 1757, his 'loving and diligent spouse' contributed fine hand-coloring to the prints". Muscarum Atque Culicum - Tab. 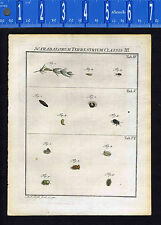 Roesel/Rosel 1749 Hand-Colored Natural History Print. The Nature of Prints & Engravings : It was not until the 20th century that prints were commonly produced for the print itself. Classis I Papilionum Nocturnorum (Nocturnal Butterflies & Moths) - Suppl. Roesel/Rosel 1746 Hand-Colored Natural History Print. The Nature of Prints & Engravings : It was not until the 20th century that prints were commonly produced for the print itself. Roesel/Rosel 1746 Hand-Colored Natural History Print. The Nature of Prints & Engravings : It was not until the 20th century that prints were commonly produced for the print itself. Prior to this, virtually all prints (and engravings) were produced as illustrations to be included in a manuscript, book, newspaper, or pamphlet. FORMICALEO - Insect Larva - Antlion or Ant Lion. FORMICALEO -Tafel XVIII (43). It is based on Rösel’s collection of insects. "Roesel also made the engravings of his drawings and, until his death in 1757, his 'loving and diligent spouse' contributed fine hand-coloring to the prints". FORMICALEO - Insect Larva - Antlion or Ant Lion. 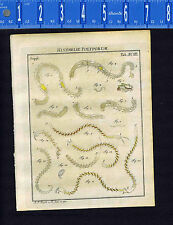 FORMICALEO -Tafel XVIIII (44). It is based on Rösel’s collection of insects. "Roesel also made the engravings of his drawings and, until his death in 1757, his 'loving and diligent spouse' contributed fine hand-coloring to the prints". Classis I Papilionum Nocturnorum (Nocturnal Butterflies & Moths) - Suppl. Moth Caterpillars on Leaves & Berries (.A Super Print). Roesel/Rosel 1740 Hand-Colored Natural History Print. It is based on Rösel’s collection of insects. Scaribaeorum Terrestrial, Classis II - Tafel III. Roesel/Rosel 1749 Hand-Colored Natural History Print. It is based on Rösel’s collection of insects. "Roesel also made the engravings of his drawings and, until his death in 1757, his 'loving and diligent spouse' contributed fine hand-coloring to the prints". Classis II & II Papilionum Nocturnorum (Nocturnal Butterflies & Moths) - Suppl. XIII & XIV (One engraving). Roesel/Rosel 1746 Hand-Colored Natural History Print. The Nature of Prints & Engravings : It was not until the 20th century that prints were commonly produced for the print itself. Classis I Papilionum Nocturnorum (Nocturnal Butterflies & Moths) - Suppl. Roesel/Rosel 1740 Hand-Colored Natural History Print. It is based on Rösel’s collection of insects. "Roesel also made the engravings of his drawings and, until his death in 1757, his 'loving and diligent spouse' contributed fine hand-coloring to the prints". Roesel/Rosel 1761 Hand-Colored Natural History Print. The Nature of Prints & Engravings : It was not until the 20th century that prints were commonly produced for the print itself. Prior to this, virtually all prints (and engravings) were produced as illustrations to be included in a manuscript, book, newspaper, or pamphlet. Roesel/Rosel 1749 Hand-Colored Natural History Print. The Nature of Prints & Engravings : It was not until the 20th century that prints were commonly produced for the print itself. Prior to this, virtually all prints (and engravings) were produced as illustrations to be included in a manuscript, book, newspaper, or pamphlet. Papilionum Nocturnorum (Nocturnal Butterflies & Moths) - Tab. The Nature of Prints & Engravings : It was not until the 20th century that prints were commonly produced for the print itself. Prior to this, virtually all prints (and engravings) were produced as illustrations to be included in a manuscript, book, newspaper, or pamphlet. Papilionum Nocturnorum (Nocturnal Butterflies & Moths) - Tab. Roesel/Rosel 1740 Hand-Colored Natural History Print. Die schlanke, schwarz-braune Spannen-Raupe -The slim, black-brown tensioning caterpillar. 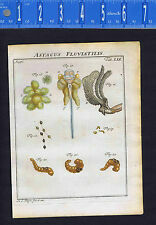 (S)caribaeorum Terrestrium - Terrestrial (Earth) Worms - Larva to Adult. It is based on Rösel’s collection of insects. "Roesel also made the engravings of his drawings and, until his death in 1757, his 'loving and diligent spouse' contributed fine hand-coloring to the prints". Classis III Papilionum Nocturnorum (Nocturnal Butterflies & Moths) - Supple. Roesel/Rosel 1740 Hand-Colored Natural History Print. It is based on Rösel’s collection of insects. "Roesel also made the engravings of his drawings and, until his death in 1757, his 'loving and diligent spouse' contributed fine hand-coloring to the prints". Pierre Jean Poitevin. This festive original color stipple engraving and etching on wove paper was executed by the French artist Pierre Jean Poitevin. It is signed by the artist in pencil on the lower right, and numbered 11/300 in pencil on the lower left. Scaribaeorum Terrestrial -Tafel VIII. It is based on Rösel’s collection of insects. "Roesel also made the engravings of his drawings and, until his death in 1757, his 'loving and diligent spouse' contributed fine hand-coloring to the prints". Insectorum Aquatilium - Hirudo Piscium (Parasite). Roesel/Rosel 1749 Hand-Colored Natural History Print. Insectorum Aquatilium (Aquatic Insects) -- Tafel XXXI/XXXII. The Nature of Prints & Engravings : It was not until the 20th century that prints were commonly produced for the print itself. Insectorum Aquatilium (Aquatic Insects) -- Tafel IV. Roesel/Rosel 1749 Hand-Colored Natural History Print. The Nature of Prints & Engravings : It was not until the 20th century that prints were commonly produced for the print itself. Papilionum Nocturnorum (Nocturnal Butterflies & Moths) - Tab. It is based on Rösel’s collection of insects. "Roesel also made the engravings of his drawings and, until his death in 1757, his 'loving and diligent spouse' contributed fine hand-coloring to the prints". Classis I Papilionum Diurnorum (Diurnal Butterflies & Moths) - Tab. The Lone Thorn Caterpillar. Roesel/Rosel 1746 Hand-Colored Natural History Print. The Nature of Prints & Engravings : It was not until the 20th century that prints were commonly produced for the print itself. Papilionum Nocturnorum (Nocturnal Butterflies & Moths) - Tab. VII-XI (7 11). The Nature of Prints & Engravings : It was not until the 20th century that prints were commonly produced for the print itself. Classis II Papilionum Diurnorum (Diurnal Butterflies & Moths) - Tab. 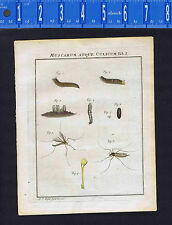 Roesel/Rosel 1746 Hand-Colored Natural History Print. The Nature of Prints & Engravings : It was not until the 20th century that prints were commonly produced for the print itself. Printed in 1909. Title: Maria. "Pears, Peaches, Plums and Grapes". Title: "No 7, Pears, Peaches, Plums and Grapes". By JEAN-LOUIS PROVOST. Flowers & Fruits. Note: Image from the Collection des Fleurs et des Fruits, published Vilquin, Paris, France, 1805.